« Apple to Unveil New Apple Watch and 4-inch iPhone 6c in March? 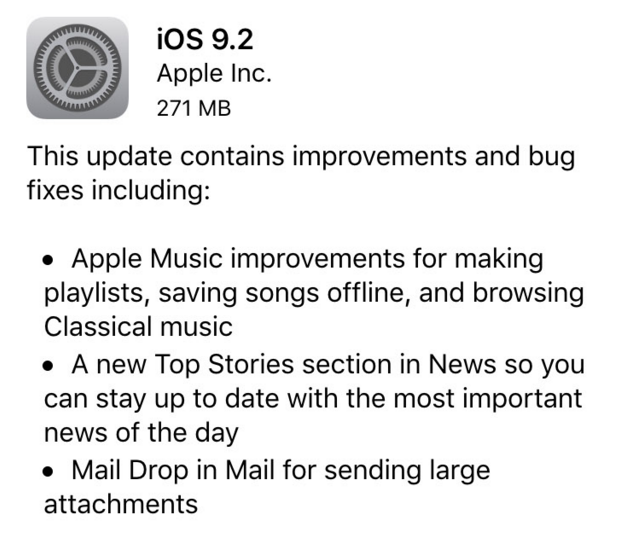 Apple Music improvements for making playlists, saving songs offline, and browsing Classical music. iOS 9.2 is compatible with iPhone 4S, 5, 5c, 5s, 6, 6 Plus, 6s, 6s Plus, iPad 2, 3, 4, iPad Air, iPad Air 2, iPad Mini, iPad mini 2, 3, 4, iPad Pro as well as with iPod touch 5G and 6G. If you have a compatible device and want to upgrade to the latest iOS version, you can do this right now using either iTunes or the Software Update section of the Settings app on your device. Before the upgrade, make a backup and check your network connection.